LOS ANGELES - March 8, 2019 - PRLog -- In celebration of International Women's Day and its 10th anniversary, Diversity in Cannes, the independent film movement promoting inclusion at the Cannes Film Festival announces its 2019 Top 10 Women in Film to Watch. Curated by its creator, Yolonda Brinkley and its globally diverse screening committee, the filmmakers are chosen based on their body of work, their efforts to forge positive visibility of women, to challenge stereotypes and gender bias with their content as well as their approach to filmmaking. Selected from one thousand filmmakers who have submitted short films and web series to the Diversity in Cannes Short Film Showcase between January 2013 and April 2018, the filmmakers represent Australia, Cuba, India, New Zealand, The United States and Turkey. While all filmmakers weren't Showcase official selections, they are recognized for their ability to educate, entertain and to influence the beliefs of others in relation to the female narrative worldwide. "I am excited to celebrate 10 years of independently promoting inclusion at the Cannes Film Festival and to announce the Inaugural Diversity in Cannes Top 10 Women in Film To Watch in honor of International Women's Day," comments Yolonda Brinkley, U.S. based entertainment publicist and creator of Beyond Borders: Diversity in Cannes. "At a time when the global film industry continues to struggle with gender parity, I am thrilled to celebrate women in film striving to #BalanceforBetter during Women's History Month!" 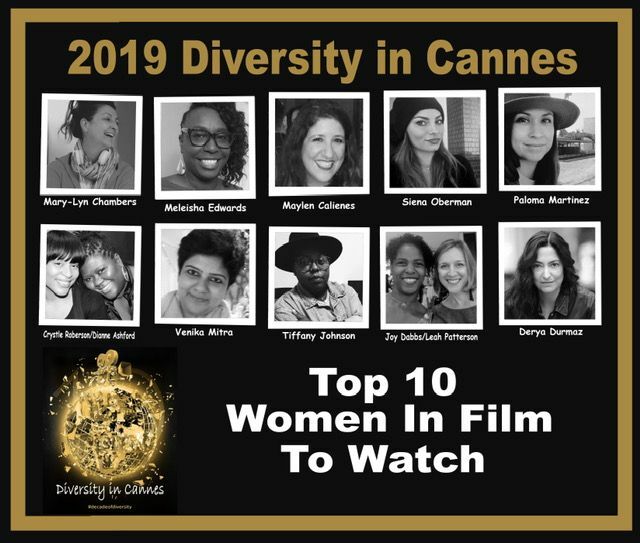 The 2019 Top 10 Women in Film To Watch will be celebrated with a social media campaign and acknowledged at the independent Diversity Day reception in May 2019 during the 72nd Festival de Cannes. The inaugural Top 10 Filmmakers to Watch series featured the Top 10 Black Filmmakers To Watch during Black History Month and will culminate with the Diversity in Cannes Top 10 Filmmakers To Watch announced in May 2019. To learn more about the Diversity in Cannes Top 10 Filmmaker Series or the independent movement promoting inclusion at the Cannes Film Festival email diversityincannes@hotmail.com or follow @diversesncannes on social media. Alternatively, to be considered for the 2019 Diversity in Cannes Short Film Showcase, women in film, submit your shorts, web series and or music videos via filmfreeway.com/diversityincannes. Use code DICWHM2019 for a special Women's History Month discount.